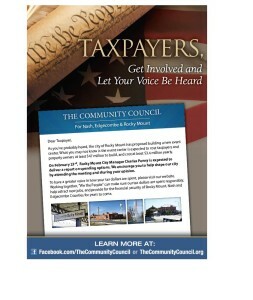 To the Taxpayers of Rocky Mount, NC...How much more are you willing to pay? The proposed 2018-19 budget by the Rocky Mount City Manager includes a $5.8 million increase. That’s a 9.13% increase from the current budget! It also includes an additional 3.8% property tax rate increase... an 18% increase over a five year period. The FY 2019 proposed budget for the City of Rocky Mount calls for a 3.8% property tax rate increase and increases spending by 9.13%. If approved the tax rate for Rocky Mount will have increased 13.22% ($0.605 to $0.685) since 2017. The city of Rocky Mount approves New Market Tax Credit financing for the Event Center and the wellness center operated by OIC. Insightful spotlight on the proposed Rocky Mount Event Center by Julie Tisdale of the John Locke Foundation. 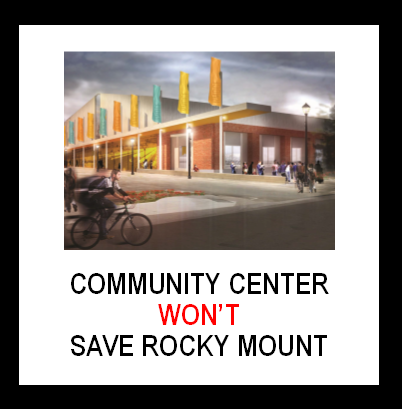 The spending spree the City of Rocky Mount leaders have spent and propose to spend on the “proposed” Event Center is not sustainable. Event Center goes from $32 million to $39 million - Oh Well! We encourage you to attend the City of Rocky Mount City Council meeting to have your voices heard. This meeting will be held Monday, August 8, 2016, 7 – 9pm in the City Council Chamber of City Hall. Nash County property owners will see tax values of their property reduced between $10,000 to $15,000 for every $100,000 worth of property while those in Rocky Mount could experience losses between $20,000 and $25,000 per $100,000 in value. Anyone who has sold or purchased property in our area can confirm the tax values mimic the market values. When will the Rocky Mount City Council and Manager pull their heads out of the sand? When will the Rocky Mount City Council and Manager pull their heads out of the sand? Who in the world is going to come to Rocky Mount when a game is cancelled due to GUNSHOTS not weather? Rocky Mount - Utility savings? Or smoke and mirrors? How much has the City of Rocky Mount allowed residential customers to share in the savings due to the recent reduction in electric and natural gas rates? It was interesting to read the Rocky Mount Telegram Editorial in support of the North Carolina bond referendum. This referendum will allow North Carolina taxpayers to vote, up or down, for a $2 billion general obligation bond for infrastructure. Rocky Mount Event Center - Buyer Beware! The Rocky Mount City Council has voted. The building of the Event Center which is now called the Downtown Community Center is apparent. Thankfully, the City Council voted to have a local contractor design/build the Event Center. At the Monday - September 14, 2015 City Council meeting the construction duo of Barnhill/Holt Contractors will reveal preliminary design and layout to the public. We remain disappointed this was not put to a referendum and remain doubtful this will meet projections. The Community Council has pointed out areas of concern along with providing examples of failed projects. While saying this we hope our concerns are wrong and this proves to be the catalyst that transforms Rocky Mount. This leads us to Ralston, NE which is another example of an arena that is a drain to the taxpayers. Ralston is small but is located just outside of Omaha which sports a MSA population just shy of 1 million. Ralston citizens were allowed to vote on this project which passed with 80% approval. Voters were told this would be so successful property taxes would be cut by 33%, construction debt would be serviced and the arena would generate a profit. Instead the forecasted revenue is $1 million short and operations exceeded the forecast by $2 million. Now Ralston citizens are faced with a property tax increase, funds diverted to cover debt and the potential of bankruptcy. Here's to success and as the band R.E.M. sang about here's to Shiny Happy People. Buyer Beware! On Monday night, June 8th, the Rocky Mount City Council will consider a new budget that includes increases to the property tax in addition to water and sewer rates. The property tax increase is to build the event center when it has not even been approved by the City Council or the NC Local Government Commission. Property Taxes include things such as homes, land, cars, trucks, boats, etc. On Monday, June 22nd, the Edgecombe County Commissioners will consider a new budget that includes a substantial property tax increase of $0.075 (7.73% increase). 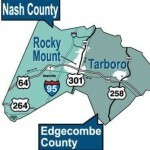 This will move Edgecombe County from the third highest property tax rate in North Carolina to the second highest. Currently Northhampton County has a tax rate of $0.92 and Scotland County has a tax rate of $1.03. 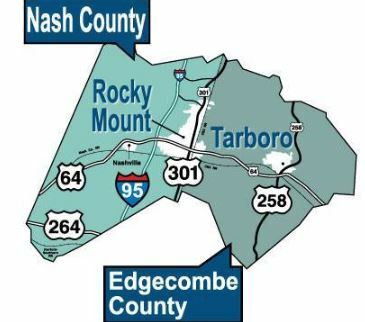 The Edgecombe side of Rocky Mount will have a property tax rate 19% higher than the Nash side of Rocky Mount. Currently there is a 15.25% property tax difference for the same jurisdictions. 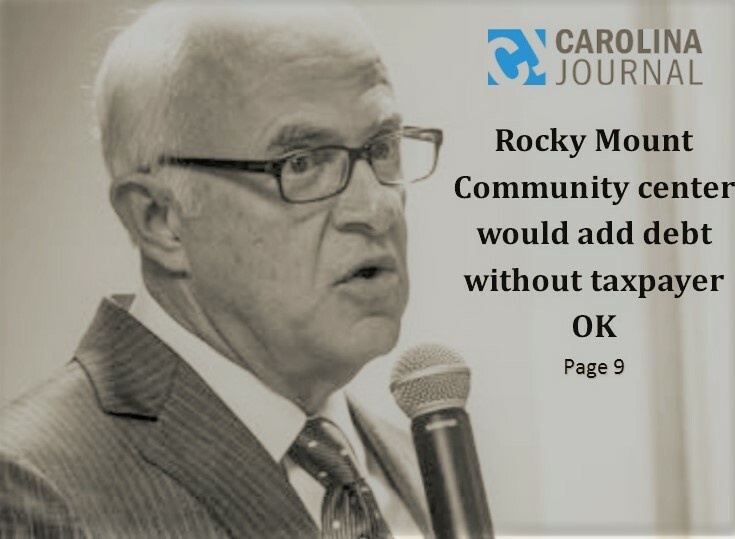 Rocky Mount Telegram letter to editor states how the "proposed" event center and sales tax legislation could result in Rocky Mount increasing property taxes by 20%. Here we try to breakdown the SFA presentation to be less confusing. 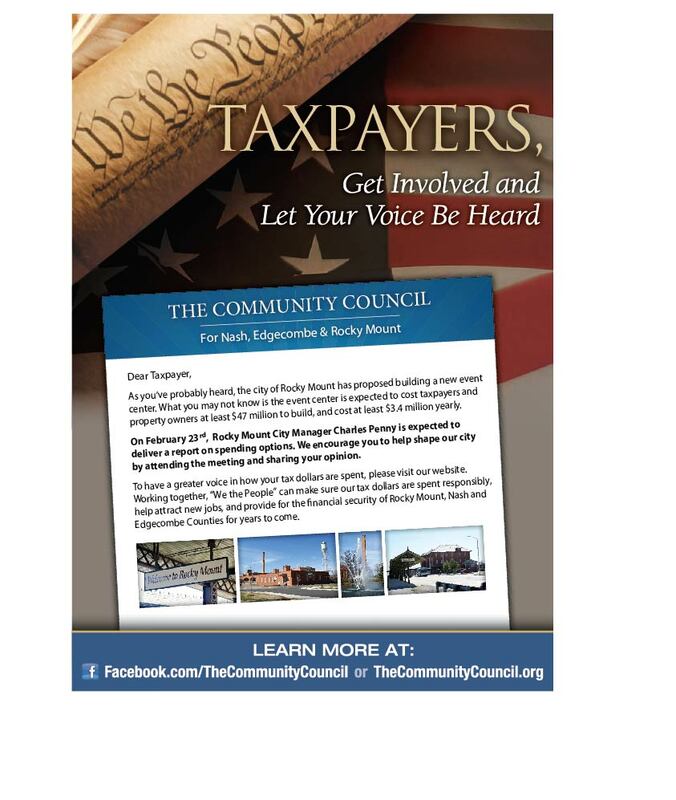 On February 23, 2015 the Rocky Mount City Council held an informational meeting regarding the "proposed" event center for citizens and property tax payers. Will the Rocky Mount City Council tap EB-5 funding to finance the "proposed" event center? 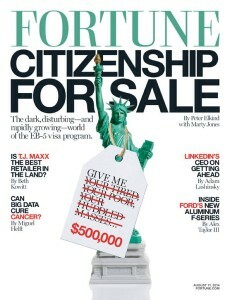 EB-5 funding is back in the news. We want to take a few moments to update you on The Community Council and our plans regarding the “proposed” event center by the Rocky Mount City Council. The Charlotte City Council will vote to stick creditors with $22.8 million of debt owed for the NASCAR Hall of Fame. Rocky Mount's option for funding the "proposed" event center. Author Heywood Sanders of Convention Center Follies speaks at the John Locke Foundation Shaftesbury Society luncheon September 29, 2014. This year The Community Council has been working and researching various topics which impact our community. It appears Hickory, NC is in a similar position to Rocky Mount, NC. Over the past few months the Rocky Mount City Manager and Council have made some bold proposals that impact our community. How much more can we handle? According to the Rocky Mount Telegram we will likely see a 7% increase in our electric and gas bills while sewer charges will increase by 5%. Is it Possible to Make the "Proposed" Event Center Profitable? It comes to no surprise that the Rocky Mount City Council votes to proceed with securing funds (including, but not limited to EB-5 and New Market Tax Credits) for funding of the "proposed" event center. What's up with New Market Tax Credits (NMTC)? Has the government cut the New Market Tax Credits by $5 billion? This audio provides great insight into the mindset of the Rocky Mount City Council. 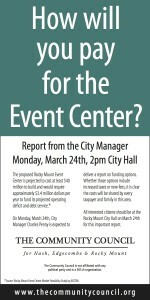 Rocky Mount Telegram Opposes the Proposed Event Center. On March 24th, the Rocky Mount City Council Committee of the Whole Meeting consisted of presentations by Davenport & Company, Bridget Chisholm with BWC Consulting and an attorney. How will you pay for the Event Center? We encourage folks to read both the Rocky Mount Event Center Market Feasibility Study by AECOM and Frequently Asked Questions piece published by the City of Rocky Mount. 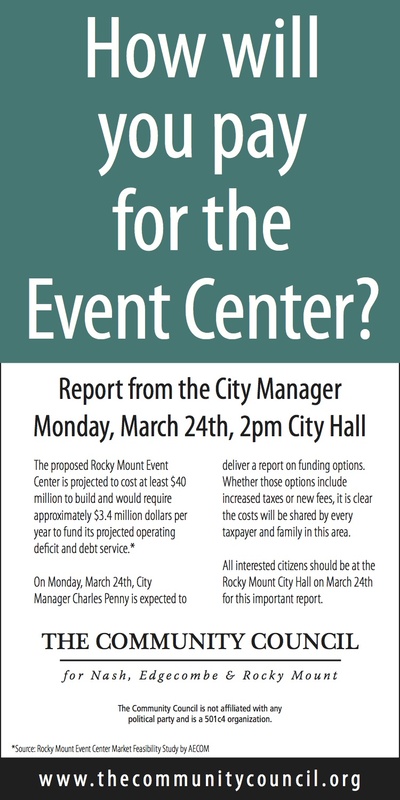 Rocky Mount City Manager, Charles Penny, will present financing options for the proposed Event Center at the 2:00 PM City Council of the Whole Meeting March 24, 2014. Wrong Time, Wrong Place, Maybe Wrong all the way Around? The proposed Downtown Event Center should be a concern to every citizen in the City of Rocky Mount, Nash and Edgecombe Counties. The City of Rocky Mount has released the proposed Event Center Market/Feasibility Study by AECOM Technical Services, Inc (AECOM).